NEW CG1-100 Semi-automatic Double Torch Gas Cutting Machine Cutter. 1, It can cut steel plate with the thickness over 8mm with medium-pressure acetylene and high pressure oxygen. 2, It primarily conducts linear cutting, whereas the machine also deals with circular cutting with the specification over 200mm as well as miter cutting and V-shaped cutting. 3, Processes like flame hardening and plastic welding are also available with the auxiliary devices and the machine's independent power supply. 4, it has realized compact construction, convenient operation and high operational safety. The preparation time is short, extending favorable economic benefit. 5, It is suitable for processing in shipbuilding, bridge works and heavy machinery, as well as for steel plate cutting in large, medium and small sized plants. 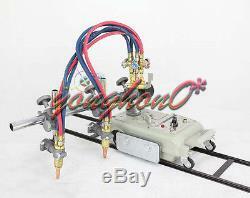 6, The machine could also be fit with CO3 cutting nozzle for propane gas cutting. 7, The main Body is made of aluminum of high strength by diecasting minutely. 8, The machine has the advantages of light weight, high strength and bear the corrosion etc. 9, It is driven by ZYT261DC servo motor, which features small construction and high durability. The motor is able to rotate clockwise or counterclockwise. The motor is directly linked to gear reducer so as to drive the roller. 10, Through out phase capacitance control on the size of angle of opening with thyristor flow meter, it can realize step less speed regulation of the motor. During operation, switch on the 4.7 K potentiometer's knob to regulate the cutting speed within 50- 750 mm/min in a step less way. 11, The cutting torch consists of oxyacetylene distributor, lateral rod, cutting nozzle, lifting mechanism and so on. Through transmission of the gears and racks, the cutting nozzle moves up and down and to the left or right, facilitating the regulation. The tightening screws of the cutting torch move within ±45°. 12, Connection to long guider real is allowed when a long component is to be cut. Specifications: -Input Voltage: AC 220 V, 50 Hz/ 60 Hz (Optional) -Thickness of Steel Plate Cutting: 8 - 100 mm -Regulation Range: 50 - 750 mm/min (Stepless speed regulation) -Diameter of Circumference for Cutting: Ø200 - Ø2000 mm -Gas: Propane or Acetylene + oxygen Optional, Please leave us a message about the gas you will use and we wil send you the machine with corresponding Nozzle. Type of Guide Rail: -The frame provides one type of guide rail: convex. The machine is supplied with GO2 1 3 cutting nozzles. 0.20 - 0.30. 0.25 - 0.35. 0.3 - 0.4. 0.4 - 0.5. Total Weight: 28.5 kg. Packing included GO2 1 3 cutting nozzles (1pcs/per) Convex Guide Rail (2 pcs) Cirle Cutting Tool (1 set) Manual 1PCS. Thank you for your support. However, we will try our best to minimize it. We stand behind every product we sell. You can enjoy top-quality product and high-quality services from us, Trust me that you will have a pleasant shopping experience in here. The item "NEW CG1-100 Semi-automatic Double Torch Gas Cutting Machine Cutter" is in sale since Wednesday, August 1, 2018. This item is in the category "Business & Industrial\CNC, Metalworking & Manufacturing\Welding & Soldering Equipment\Welding\Other Welding Equipment". The seller is "yonghon0*" and is located in China.